Hi friends! If you don't know me, my name is Kat. I run the blog Kat Stays Polished and today I am doing a special post for my lovely friend Babi who is away for a couple of months. I normally do not do too much nail art on my blog and I certainly don't do many pink manis because pink is just not my thing. Since this is a special occasion...rules can be broken...right? So today I am doing a very easy pink mani with a glitter accent nail. I actually really love the way this turned out so I hope you like it and maybe even try it out for yourself! I'll be using: Out the Door Northern Lights | China Glaze Float On | Salon Perfect Save Me a Spot | Candy Lacquer Sugar Skulls. Okay, ready for all of the complicated instructions? Paint your nails with 2 coats of Float On and let dry completely. 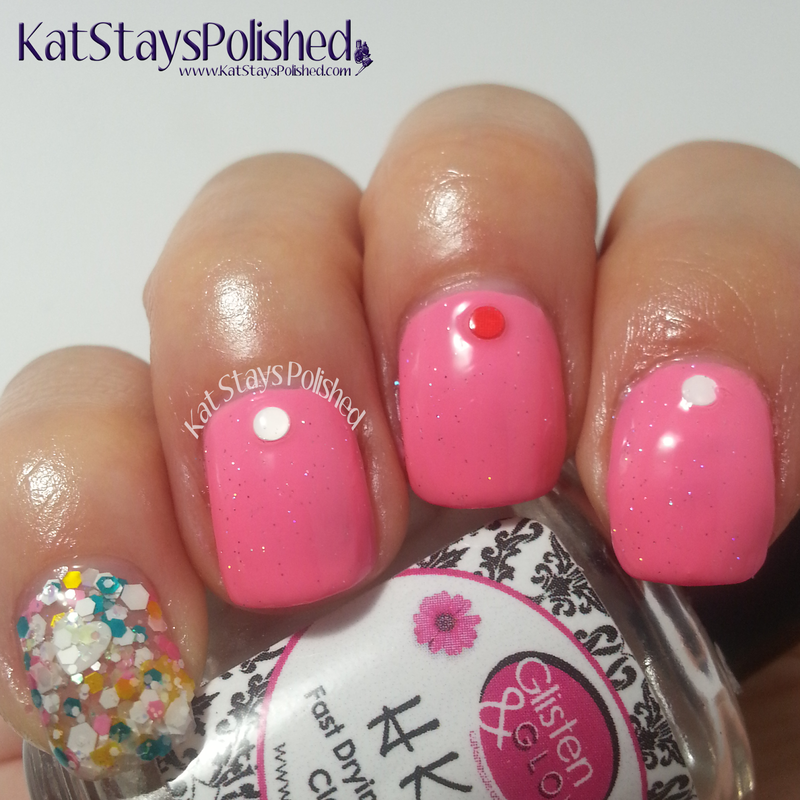 Take the red and white dots from Save Me a Spot and place a dot in the center of your nail closest to the cuticle. On the fingers you placed the dots, add a layer of Northern Lights. Cover your accent nail with 2-3 coats of Sugar Skulls. 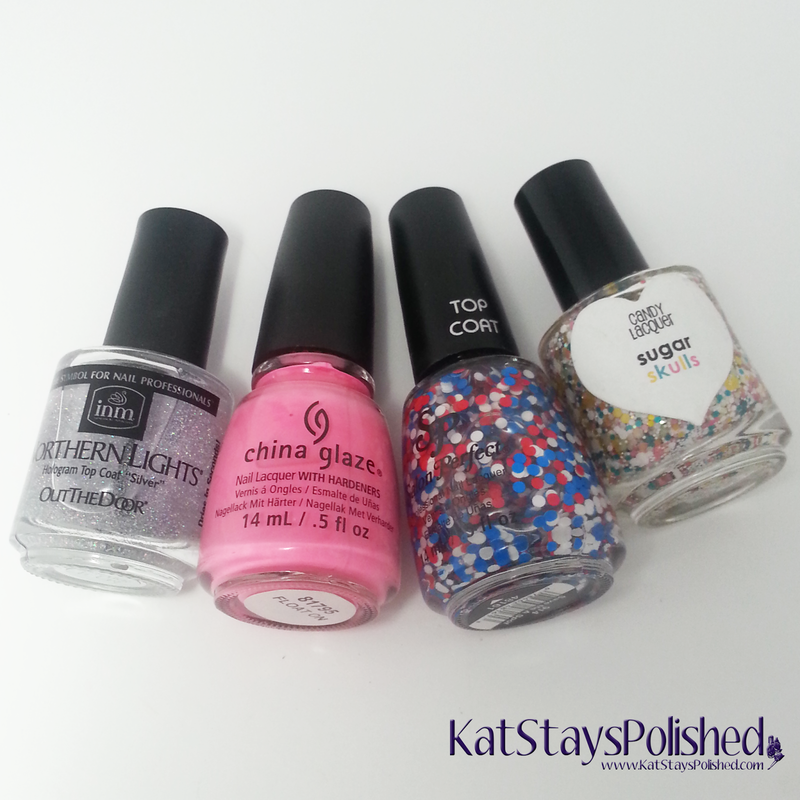 Top everything off with your favorite top coat. Today's choice is Glisten & Glow HK Girl. This couldn't have been easier, huh? It's really nice and bright for summer but still girly enough for the girliest of girls. I hope you enjoyed this post and I hope you try this out for yourself! What other colors do you think you'd try? Such creative nail art! If I had a steadier hand, I'd try to replicate it myself! I was also wondering if you've ever tried Vain Pursuits? I'd love to have your thoughts on them! I've started hearing about Vain Pursuits as well. Been looking for reviews online too before I purchase! Do you know anything about their Vain Kits?